What’s your job worth to you? For forklift driver Robert McKevitt, the price is less than a dollar. McKevitt, of Spirit Lake, Iowa, recently went to purchase a candy bar at his job in the Polaris Industries’ warehouse in Milford. So far, so good. Employees purchase thousands of candy bars every day at offices all across America. But for McKevitt, this candy bar wasn’t about to go quietly into the candy collection bin. His would-be snack, a Twix bar, was hung up by a spiral metal hook. The Twix refused to twist the whole way. Uh-oh. We’ve all been there. 99% of the time, a candy bar purchase goes off without any problems. But there’s always the annoying time when that candy, gum or drink just won’t cooperate. Usually, a gentle nudge on the vending machine or quick tap on the side will jar the item loose. And even if that doesn’t work, you walk away. Stuff happens, that’s life. Except McKevitt didn’t walk away. He must’ve been very hungry, because he approached the vending machine with an 8,000 pound forklift and then lifted (and dropped) it multiple times. It actually did the trick – the Twix and two other candy bars fell into the chute. Just one small problem, however. It’s generally an unsafe move to drive a forklift into a vending area and lift & drop the machine – and also kind of boneheaded. McKevitt was fired less than a week later. No word on whether or not Polaris plans to bolt the new vending machines to the floor, just in case a hungry forklift driver gets any ideas. The incident is eerily similar to the Seinfeld episode when George Costanza purchased a Twix bar (what else? ), only to have the candy tease him from the ledge. But instead of having a forklift driver move the machine around, George lost the Twix to the next vending customer. Poor George. And poor Robert McKevitt. But this might have been avoided in the first place with common sense safety practices. 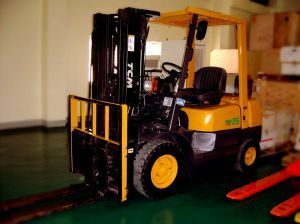 CertifyMe.net offers OSHA-compliant forklift training and certification for new employees, veteran drivers and even those people who would consider lifting up and dropping a vending machine to get a Twix bar. For the record, we’d frown upon the forklift-as-hunger-buster method. If you’d like to schedule classes or train yourself (or your drivers), please call us at (888) 699-4800, or visit our contact page. Thanks for reading our blog!